The governors, Republican and Democrat, who won't take Syrian refugees. 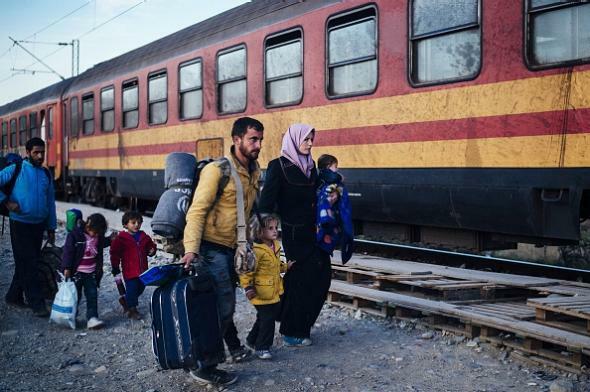 A refugee family boards a train to Serbia near Gevgelija, Macedonia, on Nov. 16, 2015. A number of governors have reacted to Friday’s terror attacks in Paris—which were for the most part carried out by French nationals and were allegedly planned by a Belgian citizen—by announcing that they are opposed to accepting any of the Syrian refugees the U.S. has committed to take in over the next year. Per an answer at this State Department press conference, the federal government consults with state governments to determine what capacity they have to take in refugees, though it does not appear that states have the right to refuse refugees altogether given the broad constitutional authority the executive branch has over foreign affairs as well as the specific tenets of 1980’s Refugee Act. Perhaps bearing this in mind, most of the governors listed below have described their opposition as a temporary measure until further and as-yet-undefined security screening measures are put in place. Republican Gov. Nikki Haley of South Carolina said Monday that she would not oppose the settlement of Syrian refugees in her state, as did Connecticut Democrat Dannel Malloy, Pennsylvania Democrat Tom Wolf, and Vermont Democrat Peter Shumlin. This post will be updated as necessary.